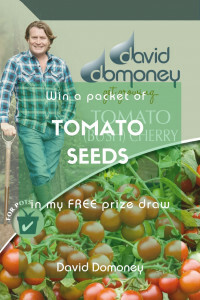 With the weather still so chilly outside, it’s the perfect time to spend a cosy afternoon designing your dream garden. 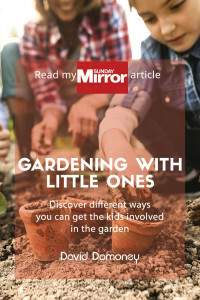 Perhaps you’ve noticed recently that your garden is looking a little lacklustre and needs a refresh, or maybe you’ve just moved in to a place where the garden needs a total overhaul. 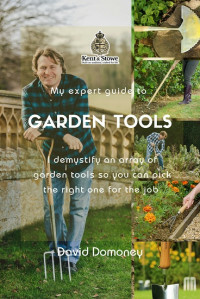 Whatever the case, getting a few ideas together now means you can get to work on the design elements before spring begins and have your new garden looking fabulous by the time the weather picks up again. Mediterranean gardens are a classic mix of rustic furniture and fragrant, colourful planting, and they work surprisingly well in our British climate. They’re generally relaxed and informal, and are so loved for their familiar, weathered look that inspires nostalgic memories of family holidays. 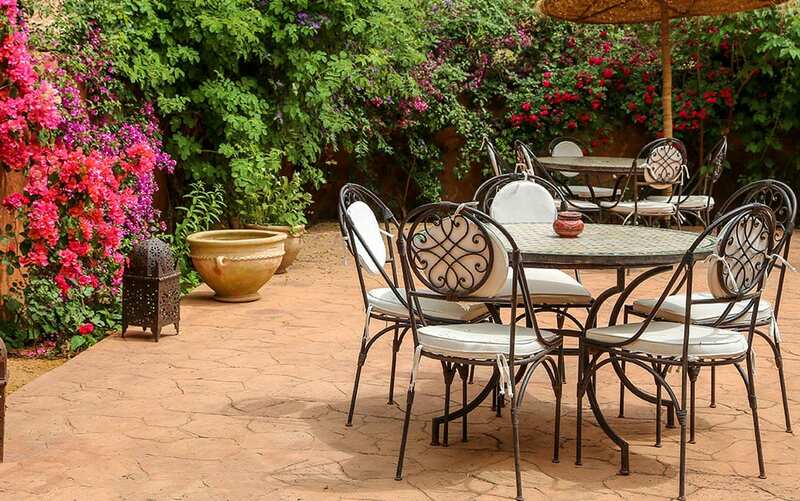 They have an emphasis on outdoor living, especially entertaining friends and family in relaxed seating areas, as many Mediterranean families traditionally do. 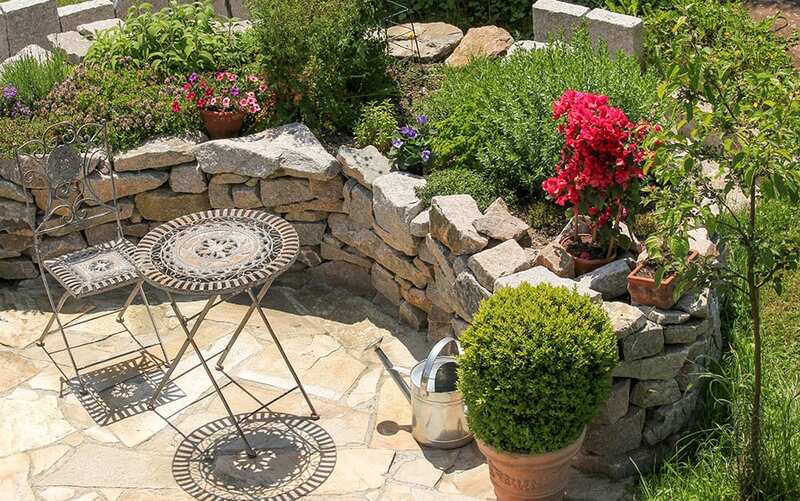 Creating a Mediterranean garden in your space is a fantastic way to ensure you spend more time relaxing in your garden this summer, and less time working – as their relaxed style needs little maintenance and emulates the Mediterranean way of life. 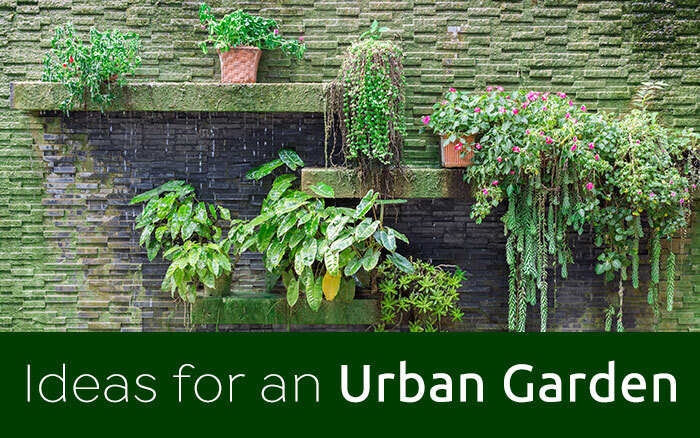 If you’ve been thinking about transforming your garden in this style, here are a few ideas to get you started. I’ve outlined the key elements of Mediterranean garden design, and the ways you can implement them into your own garden. 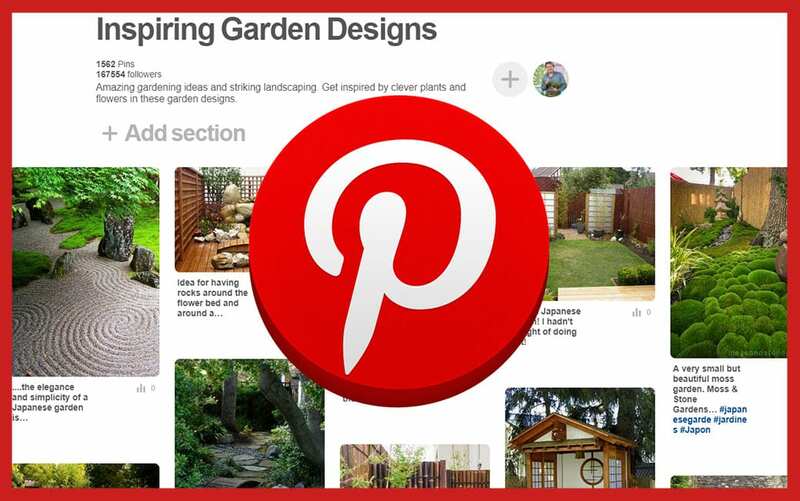 A really good place to start with any garden design is with your plant choices. You can use your chosen plants as a subtle nod towards the overall theme, as well as to create the basis towards your structure. 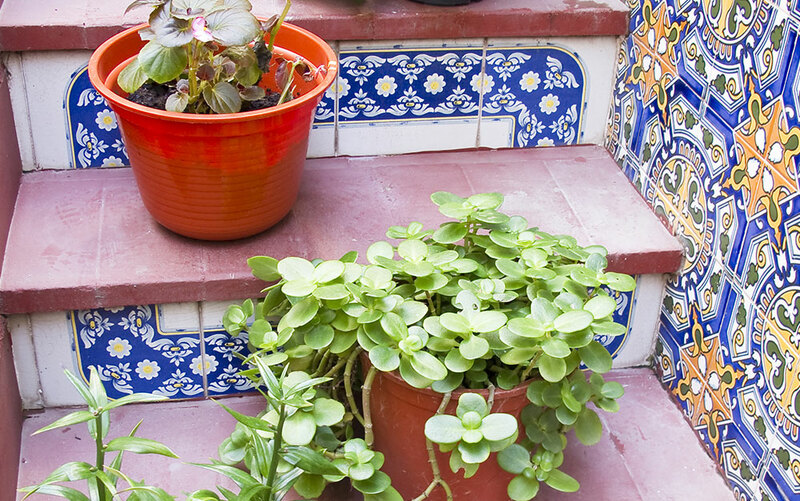 Think colourful flowers in terracotta pots and exuberant climbers tumbling over walls. 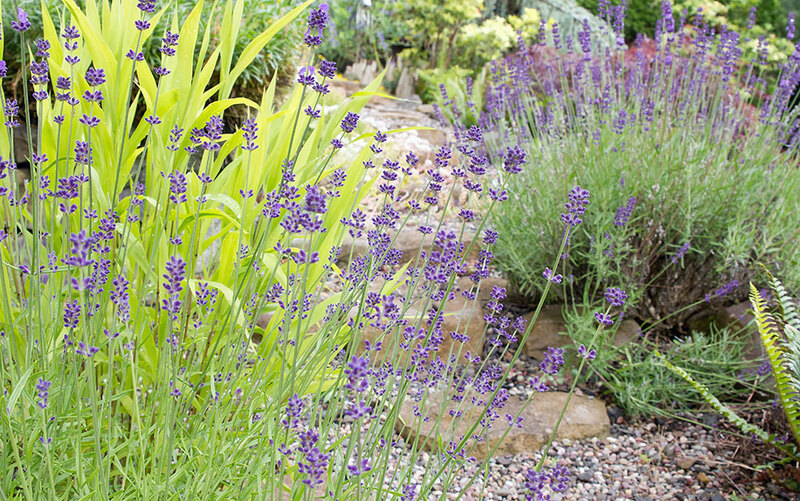 A Mediterranean garden will always smell as good as it looks – so pick plants for fragrance as well as colour. Olive trees are a classic nod to the theme, and they work well in any size or shape of garden, either as a focal point, or nestled in the corner in a large container. They probably won’t bear fruit in this country, (although there is a chance they will) but their silvery green leaves are emphatic of warmer climes. Choose a sunny, sheltered spot for your Olea Eurpoea. Herbs: Particularly lavender and rosemary, herbs are great for bringing warming scents as well as structure. Plant rampantly along a path for a fragrant and inviting walkway. Palm Trees: Nothing is more symbolic of the continental coastline than a palm tree. They need shelter from exposed conditions, and some may need protection when temperatures drop below -5C. Try the Trachycarpus Fortunei. Red Hot Poker: These are a striking and unique addition to your garden and somehow just the look of them seems to make the garden feel warmer. 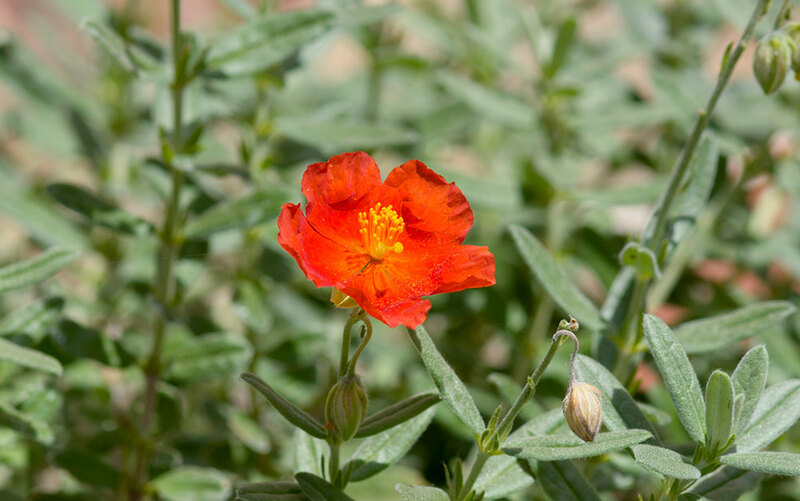 Rock Rose: A sun-loving evergreen shrub that will look fabulous at the front of your borders, with colourful flowers tumbling out through spring and summer. 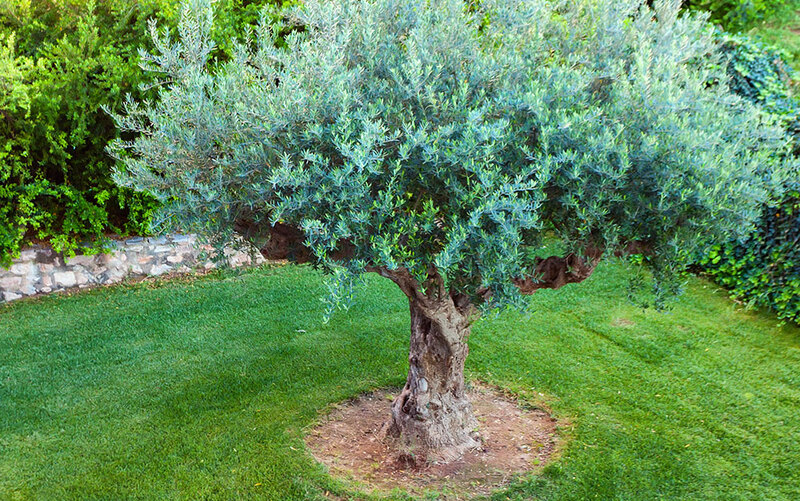 The olive tree has long been a symbol for peace – and what could be more peaceful than a Mediterranean garden? Olives and olive oil are also an integral part of a Mediterranean diet. 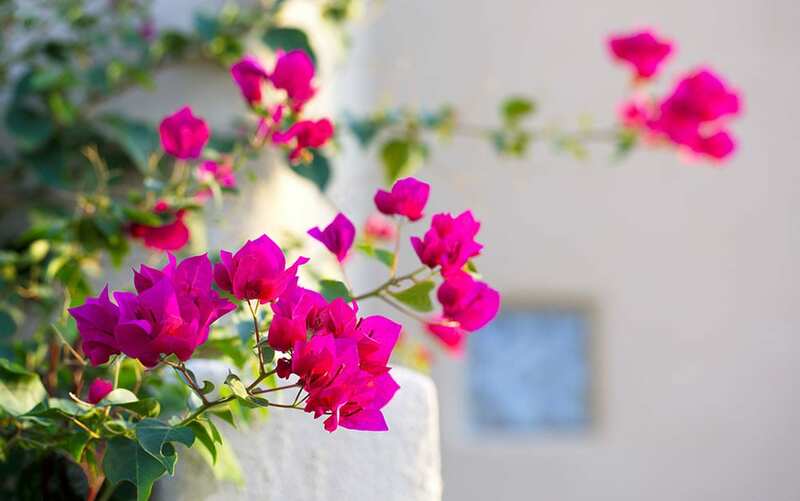 Bougainvillea: The frilly pink flowers of the bougainvillea instantly transport you to the Riviera. Grow it in containers and move under glass for the winter. 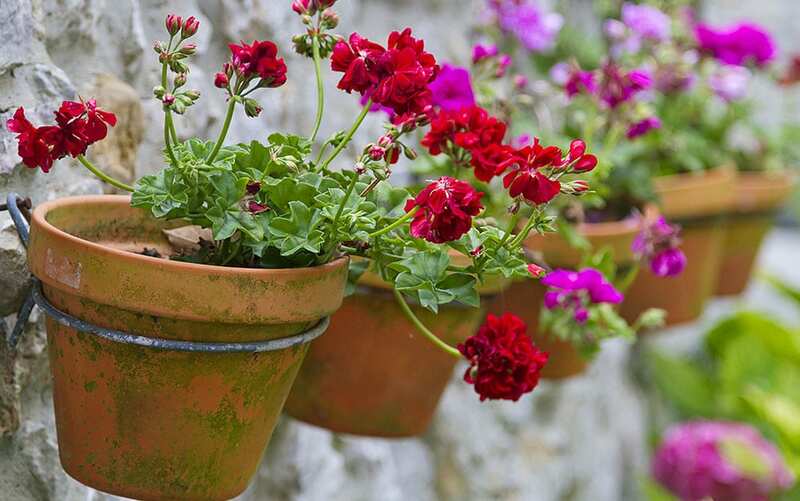 Geraniums: Perfect for pots and window boxes, geraniums will bring lots of lovely colour to your silver green and terracotta backdrop. Check out Calliope’s fantastic range. Don’t forget that many Mediterranean plants are drought tolerant and will need well-drained soil that isn’t too heavy. If you have clay soil, you can improve it by digging in plenty of organic matter as well as some horticultural grit for drainage. Always make sure your pots have holes in the bottom to allow water to drain away easily. Function is important in a Mediterranean garden, and protection from the elements in the form of shade and cooling water is a must. 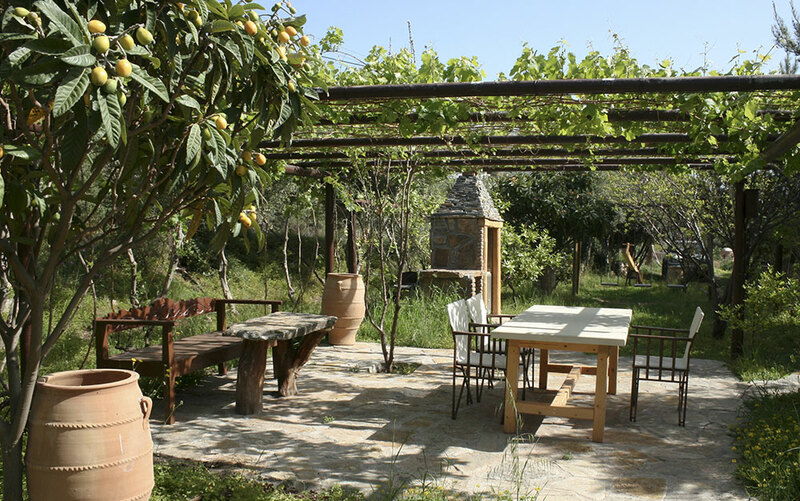 On the Mediterranean coastline, they need shelter from the hot sun, so shade is often an integral part of the garden, and you’ll see lots of pergolas and canopies there. In this country, pergolas do a great job at sheltering us from prevailing winds, as well as offering a little privacy if you are overlooked. If you have the space, a pergola draped in colourful climbing plants such as jasmine or Ipomoea is a must. For a smaller garden you may want to think about incorporating a smaller archway, or even just some higher fencing to elude to the look. Don’t even think about leaving any trellis, wall or fence bare – a Mediterranean garden grows upwards just as much as it grows outwards, and climbers and luxuriously draping tree canopies should used in full force. Whilst water features are not an essential part of the Mediterranean garden, they are a lovely additional touch, and do a good job of breaking up the dry landscape. 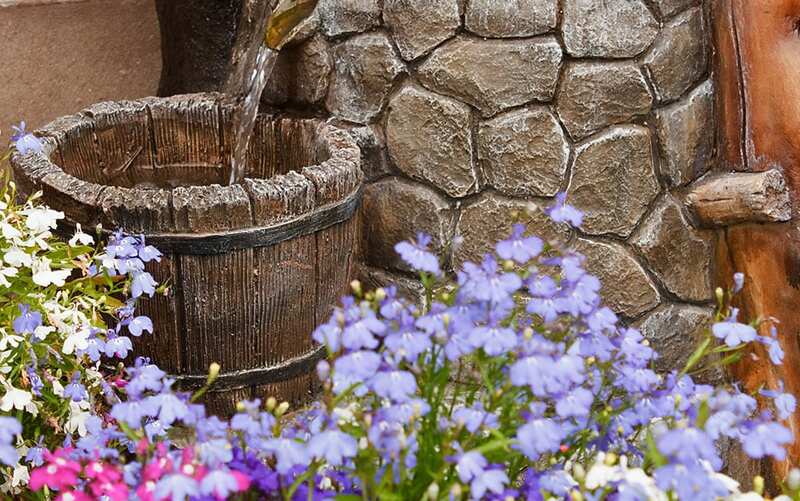 A small rustic basin fountain mounted against a wall will bring a satisfying bubbling sound, whilst a small ornamental pool will add a drop of shimmer to your otherwise weathered scene. If you don’t want to include a water feature, use bright vibrant blues in your colour scheme and pots to offset the warm terracotta tones instead. You could even think about staining your pergola in the Mediterranean blue and white too. 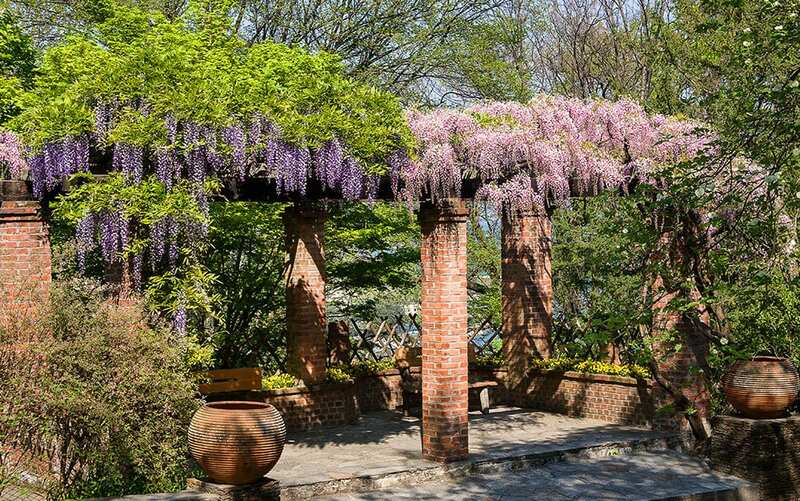 The pergola was used originally by the rich in Italy to make beautiful hanging gardens. Commoners soon found that it was also useful for providing shade and extra planting space. Hard landscaping is an integral part of the Mediterranean garden, broken up by splashes of vibrant colour. Many Mediterranean style gardens forgo lawns in favour of gravel and paving stones – making them a great option for smaller spaces, or those who don’t want the hassle of lawn maintenance. Chose warm coloured paving stones in pink and red hues, or gravel and natural stone styles. Without a lawn you may feel like there is a lot of vacant space, so split the garden into sections using pathways lined with plants and herbs. 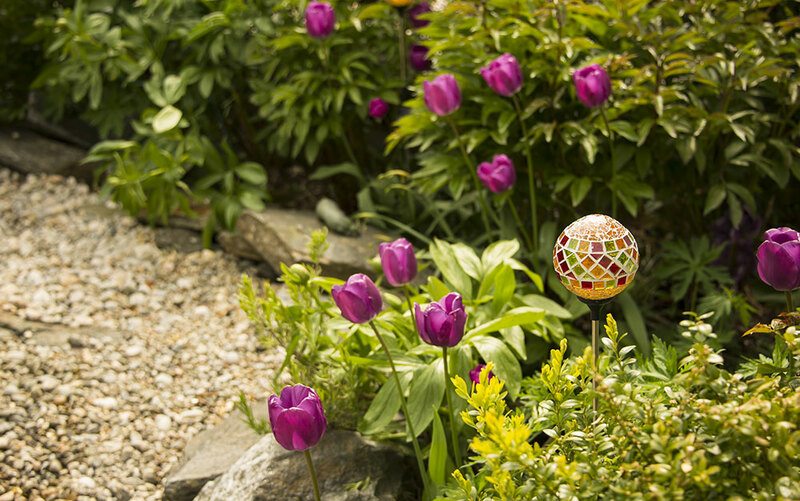 Soften the edges of any paved areas by planting ground cover plants around the edges and allow them to spill over slightly onto the stones or gravel. 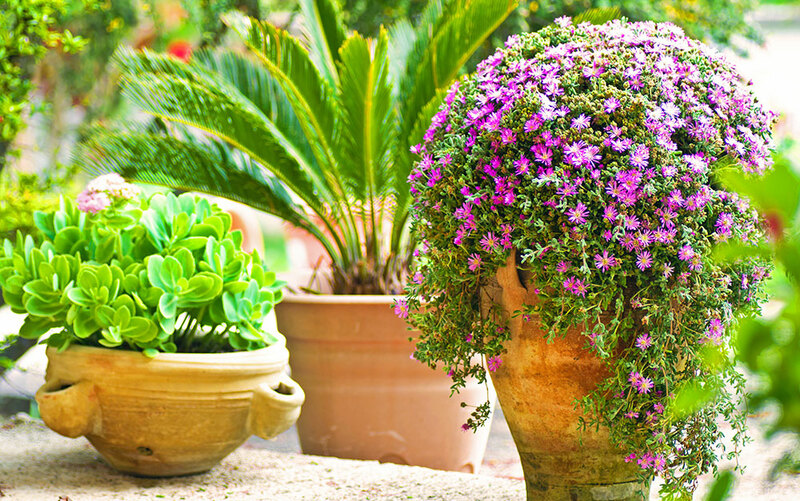 Don’t forget that a Mediterranean garden is always crammed full of pots, so plug any gaps on your patio areas with an assortment of colourful containers and large terracotta pots. Mosaics are a beautiful extra touch and could be scattered in amongst your other paving stones or used on the vertical part of steps. Mosaics have been around since Ancient Greece, where it’s thought their popularity began. 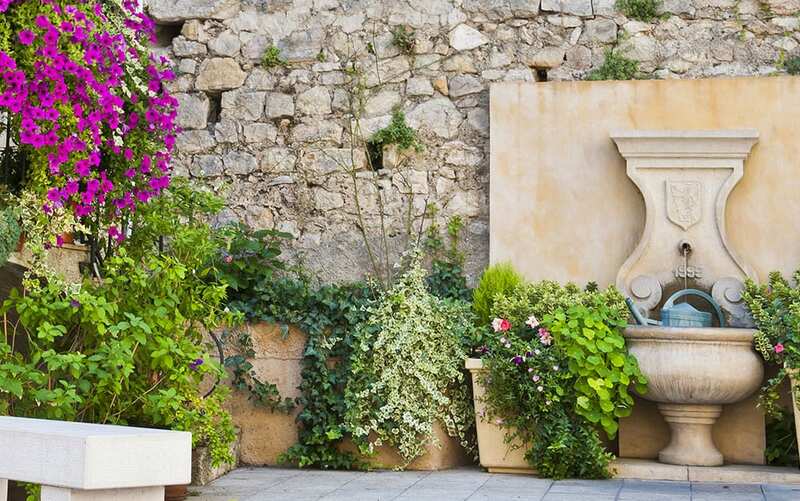 The final touch to your Mediterranean haven will be the perfect place to sit and enjoy it. It’s considered sacrilege to not have an outdoor dining area in the Mediterranean. It’s at the heart of their long-standing traditions for sharing food with large families, and relaxing outdoors with friends. Whilst we might not have quite as many sunshine days here in the UK, we still treasure those summer BBQs and entertaining in the garden. Your dining set should be quite a classic style, and cast aluminium sets are great as they are weather resistant and can be left out over winter. If you don’t have the room for a large table and chairs, then a little bistro set with a coffee table and two chairs will look just as lovely. 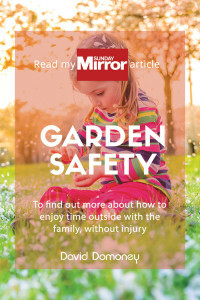 If you have a bigger space, then make sure there aren’t any sections of your garden that can’t be enjoyed from the comfort of a bench or chair – Mediterranean gardens often have several types of seating dotted around and along pathways. The phrase dining ‘al fresco’ comes from the Italian meaning ‘in the cool air’ – although Italians no longer use this to mean dining outdoors. Finally, if you really want that extra ‘wow’ factor for your Mediterranean garden, you could even add some outdoor cooking facilities such as a pizza oven or outdoor kitchen. This are becoming increasingly popular in the UK, and you’ll be the envy of all your friends and neighbours when BBQ season kicks off.